Online ordering menu for Mi Piaci. We are a local, family-owned and operated Italian Restaurant serving pizza, pasta, calzones, sub sandwiches, steak, and all of the classic Italian food favorites! 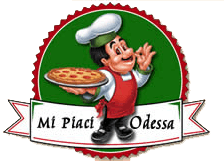 —————————————————————Hungry for the best Pizza & Italian Food in Odessa, Texas? More choices are on our online menu, order online now! Dine-In, Carry-Out, Phone Orders, and Catering are all available.—————————————————————Located at E University Boulevard & North Grandview Avenue. About a 10 minute drive from The University of Texas of the Permian Basin.